To Mike Huckabee and your fellow hypocritical brethren: you’ve really gone and done it this time. You’ve taken trolling for birther votes to a new low. MEDVED: Governor, I know you probably are out on book tour right now, you probably didn’t have a chance to watch the Academy Awards last night? 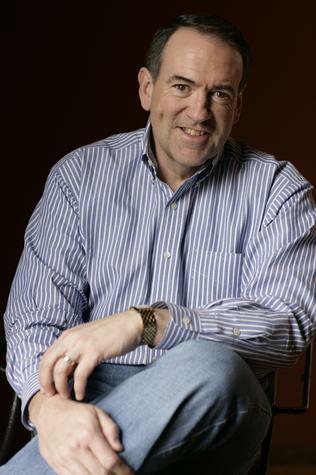 HUCKABEE: I’m very happy to say that I missed it because usually it’s about the most boring waste of several hours that I’ve ever experienced. MEDVED: Well this was a – this was a low audience. However, there was – there was one moment where a very brilliant and admirable actress named Natalie Portman won Best Actress, and she won for a movie which I loathed called Black Swan. But in any event, she got up, she was very visibly pregnant, and it’s really it’s a problem because she’s about seven months pregnant, it’s her first pregnancy, and she and the baby’s father aren’t married, and before two billion people, Natalie Portman says, ‘Oh I want to thank my love and he’s given me the most wonderful gift.’ He didn’t give her the most wonderful gift, which would be a wedding ring! And it just seems to me that sending that kind of message is problematic. Hey Mike(s): Where do you get off? First of all, please stop using the word “problematic” (I actually heard someone on CNN say “problematical” the other day)—it’s making me stagger tremendously every time I hear it. What’s next: “problematicalistically”? I must say I do get where you’re coming from about children being born out of wedlock—it is a worrying trend. Still, based on everything that you’ve been spouting off about lately, including Obama being born in Kenya, I don’t trust you or your statistics. For example, most single moms in the U.S. are not “very poor.” In fact, according to the 2009 U.S. Census, less than a third of households headed by single women are poor. I thought America was going to focus like a laser on creating more jobs—remember that? As if single mothers don’t have enough to worry about; as if they haven’t beaten themselves up enough already about past poor life choices (to paraphrase Jesus: haven’t we all been there and done that, at least once in our lives? ); and in spite of constant condemnation from all sides, from family, friends and foes alike—most single moms still stand tall, work hard, and thank God for their children every day. But no! Now they have to worry about the likes of sanctimonious pricks like you bashing them in the mass media in an attempt to get other sanctimonious pricks like you to vote for them. As a (formerly single) self-employed mother, I never lived off the government—and even if, at the time, I had to turn to government assistance to feed my kids or heat my home to survive, so what? Don’t judge. Many of us—men included—have struggled, especially in recent times, with similar economic difficulties. Many single mothers I’ve spoken to and befriended over the years have felt regulated into a single mother ghetto by their married friends. My child and I were ostracized by many of the married mothers and their families in the town where we lived; invitations and “playdates” (another awful word) from “conventional” families were extremely rare if nonexistent. In fact I can count on two fingers the number of married women I counted as close friends while I was there. More often than not, society forces single moms (and their children) to huddle together out of default. Yet while I was too busy trying to survive to feel lonely or even sorry for myself, I often wondered about the sudden dearth of married ladies in my social life; the vibe I usually got was that most of these women felt threatened by my singleness, my “otherness”. Perhaps they worried that single motherhood was contagious, or that I was after their pudgy, balding, middle-aged, middle management husbands. I worked, but I made sure I was around for my child—a financial sacrifice, to be sure, but I did my best—as one of my family members so condescendingly pointed out to me one time when my son and I visited. I managed to keep my household afloat, my son well-fed, well-dressed, and well-cared for. During my time as a single mother, as stressful and scary as it so often was, I was also extremely happy—strangely so, at least in the eyes of many of my family and friends—mainly because, as I realized even then, that I was living my life on my terms, unlike so many of them. It was wildly terrifying and liberating at the same time. When I sold my childhood home to start a new life with my man in the city, many assumed that I was making the change under financial duress and sadness, not joy and hopefulness, as was indeed the case. The realtor and buyer who came for the final inspection treated me with a cautious sympathy until they saw how happy I was to rid myself of my 3-bedroom, 2-bath burden and get on with my life. Having gone through the hell of divorce and surviving on my own as a single mom has made me extremely compassionate about what other mothers less blessed than I are up against on a daily basis. If the Mike Huckabees of the world really cared about our society and our children, they would be, too. hi Sheila — yes, very small minds indeed 🙂 But that’s all in the past! Thanks for comment and the NYT link about Natalie, I will check that out now.